We are pleased to announce that Professor Jiming Jiang has been awarded the Former Postdoc Achievement Award by the National Institute of Statistical Sciences (NISS), on August 10th, 2015. As part of the 25th anniversary celebration at the NISS-SAMSI reception, NISS initiated a new award to recognize the extraordinary achievements of some of its former postdocs. NISS started mentoring postdoctoral fellows and associates in 1993. Since that time, more than 70 people have been postdocs at NISS. 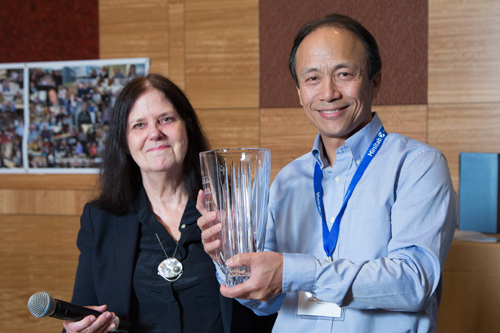 NISS announced that Jiming Jiang, Professor of Statistics at the University of California - Davis, and Laura J. Steinberg, Professor, College of Engineering and Computer Science at Syracuse University received this award, which was presented at the NISS-SAMSI reception at the 2015 Joint Statistical Meetings in Seattle, Washington on August 10. Jiming Jiang received the NISS Postdoctoral Achievement award for "Honoring his distinguished career and excellence in leadership through research, through education and through example as a role model for the profession of statistics," said Nell Sedransk, Acting Director of NISS, during her presentation of the award. Professor Jiang graduated with a Ph.D. in Statistics from the University of California Berkeley in 1995, after earlier receiving bachelors and masters degrees in Mathematics and Probability and Statistics respectively, from Peking University. After graduating from Berkeley, Jiang spent a summer as a Postdoctoral Associate at NISS. He later held academic positions at Case Western University and the University of Nebraska before being appointed as an Associate Professor in 2001 and Director of the Statistical Laboratory at UC Davis in from 2004-2007. He was promoted to Professor in 2004. Professor Jiang has published more that 80 peer review papers, and three books. He is particularly well known for his work on generalized linear mixed models, which was the subject matter of his first book. Other interests include small area estimation with applications to survey data, asymptotics and large sample statistics, and model selection. Professor Jiang has served on the editorial boards of several of the mostly highly regarded journals in statistics, including the Annals of Statistics, Journal of the American Statistical Association, and Journal of Multivariate Analysis. He is an elected member of the International Statistical Institute, and a Fellow of both the Institute of Mathematical Statistics and the American Statistical Association. Congratulations to Jiming for receiving this prestigious honor!